Continuing as a bureaucrat just got a lot tougher with the government weeding out the incompetent and taking action against 381 civil services officers, including 24 who were from the Indian Administrative Service. 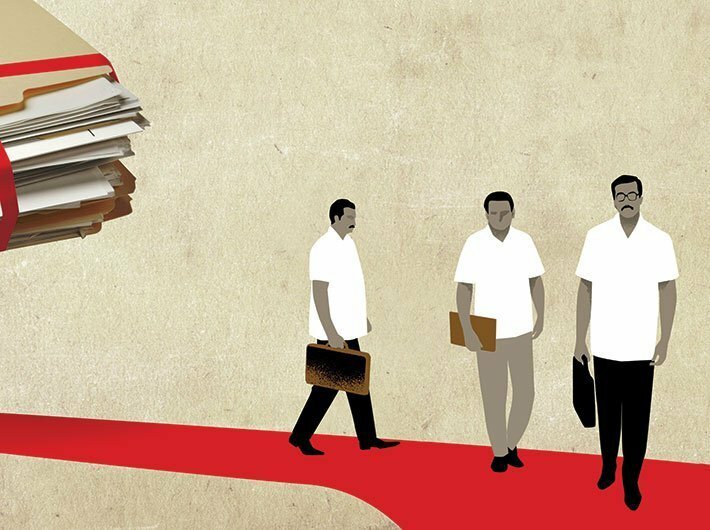 The Narendra Modi government’s action against civil servants who are non-performers and allegedly involved in illegal activities has shaken up the bureaucracy. These measures were highlighted in a booklet titled ‘3 years of sustained HR initiatives: Foundation for a new India’ and in a presentation made before Modi recently, reported the Mint. The Uttar Pradesh government too has started the process to shake up the bureaucracy. In fact, Yogi Adityanath, soon after being sworn in as chief minister of UP in March, had acted against non-government officials. He ordered the relieving of all non govt advisors, chairmen, deputy chairmen and members in corporations, committees and departments from their duties with immediate effect, reported Finance Express. The Uttar Pradesh government is now reviewing the performance of its employees and will retire or even sack those found wanting, a move that has caused a flutter among the 1.7 million strong workforce. “Those whose performance is not up to the mark would be considered for compulsorily retirement as per the government rules,” says the order issued after chief minister Yogi Adityanath called for strict adherence to the compulsory retirement rule, reported Hindustan Times. The officials would be assessed on the basis of ratings given for, among other things, timely disposal of work, punctuality and public image. More than five years back, the government had notified a rule making it compulsory for IAS, IPS and officers from other all-India services to retire in "public interest" if they fail to clear a review after 15 years of service. The Times of India reported that officers adjudged as inefficient and non-performing will be shown the door and even those who make the cut will need to remain on their toes as they face another review after 25 years of service or on turning 50, whichever happens first. The tenth report of the Second Administrative Reforms Commission notes that the life-long job security provided to a government servant leads to such a distorted incentive structure because it is a fact that under the present system, very rarely is a government servant punished or removed for poor performance. As a result, an element of complacency and inertia has got internalized in the civil services. “In the section ‘Dismissal Procedures’, the Commission has recommended a major revamp of the present system of disciplinary proceedings against government employees to ensure greater accountability and to minimise, if not eliminate, misconduct and indiscipline. In addition, the Commission feels that there is also need to find a systemic solution to the issue of complacency that stems from the lifelong job security coupled with lack of penal consequences for non-performance or inadequate performance.,” said the report. The commission was of the view that there was a need to have a comprehensive in-depth assessment at important milestones in an officer’s career. These assessments, in view of the commission, should be carried out on completion of 14 and 20 years of service. The Fifth Pay Commission, which was set up in 1993 and had submitted its report in 1997, too had recommended “golden handshake as well as compulsory retirement of those found corrupt and incompetent”.